书籍简介: \\\\\\\\\\\\\\\\\\\\\\\\\\\\\\\\\\\\\\\\\\\\\\\\\\\\\\\\\\\\\\\\\\\\\\\\\\\\\\\\\\\\\\\\"The Accidental Fundraiser fills a big gap on my shelf of indispensable books on fundraising. I've been waiting for years for someone to write this book, so I could stop hemming and hawing when people ask me how to raise money for their PTA or local theater group. Stephanie Roth and Mimi Ho have produced a common-sense, down-to-earth guide that's based on years of solid experience in grassroots fundraising. It's easy to read and full of forms and checklists that will show the most inexperienced fundraiser the path to success.\\\\\\\\\\\\\\\\\\\\\\\\\\\\\\\\\\\\\\\\\\\\\\\\\\\\\\\\\\\\\\\\\\\\\\\\\\\\\\\\\\\\\\\\"
\\\\\\\\\\\\\\\\\\\\\\\\\\\\\\\\\\\\\\\\\\\\\\\\\\\\\\\\\\\\\\\\\\\\\\\\\\\\\\\\\\\\\\\\"The Accidental Fundraiser is a quick and easy guide for the unsophisticated fundraising volunteer (like me!). The examples in each of the fundraising strategies were specific and realistic and the forms were quite useful. 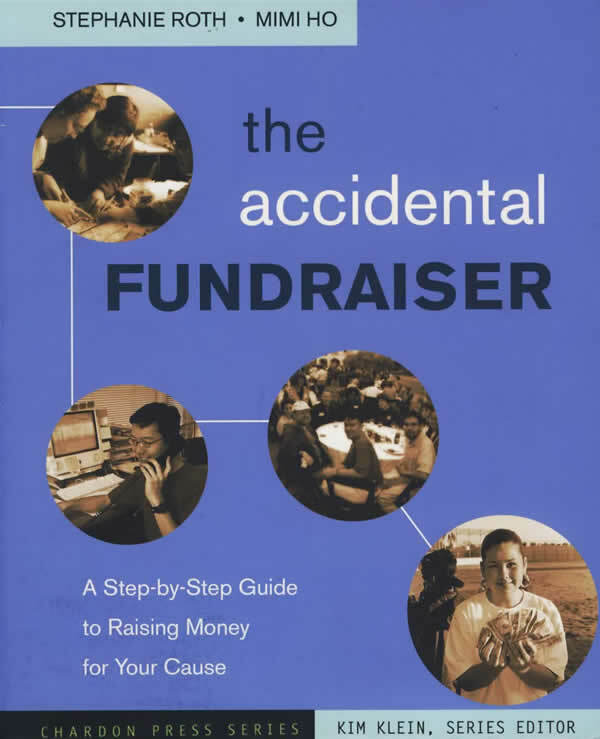 Fundraising can be an uncomfortable and sometimes overwhelming task but the book gives a clear process to follow that will give confidence to even the fundraising novice.\\\\\\\\\\\\\\\\\\\\\\\\\\\\\\\\\\\\\\\\\\\\\\\\\\\\\\\\\\\\\\\\\\\\\\\\\\\\\\\\\\\\\\\\"
\\\\\\\\\\\\\\\\\\\\\\\\\\\\\\\\\\\\\\\\\\\\\\\\\\\\\\\\\\\\\\\\\\\\\\\\\\\\\\\\\\\\\\\\"The Accidental Fundraiser is like a cookbook, complete with step-by-step recipes for fabulously delicious―and successful―fundraisers. It will turn the kitchen novice into a gourmet fundraiser.\\\\\\\\\\\\\\\\\\\\\\\\\\\\\\\\\\\\\\\\\\\\\\\\\\\\\\\\\\\\\\\\\\\\\\\\\\\\\\\\\\\\\\\\"
\\\\\\\\\\\\\\\\\\\\\\\\\\\\\\\\\\\\\\\\\\\\\\\\\\\\\\\\\\\\\\\\\\\\\\\\\\\\\\\\\\\\\\\\"The Accidental Fundraiser is a testimonial that people find a way to make a difference―even if it only starts with a car wash or a garage sale. Buy it and remind yourself: anything is possible.\\\\\\\\\\\\\\\\\\\\\\\\\\\\\\\\\\\\\\\\\\\\\\\\\\\\\\\\\\\\\\\\\\\\\\\\\\\\\\\\\\\\\\\\"